- New improved graphics and icon. - Improved internal architecture for better performance. - New Duplicate File Finder tool. - New System and Browser Monitoring (Pro Version). - Optimized and improved Registry Cleaning. - Added cleaning for Avast Antivirus 8, Adobe Photoshop CS6, Samsung Kies and Real Player 16. - Improved Drive Wiper performance. - Optimized Startup item detection algorithm. - Optimized 64-bit builds on Windows 7 and 8. - Many performance improvements and bug fixes. If you want more options to clean other software I recommend you download and install the latest winapp2.ini file. Open the link, save the page as All Files and name it winapp2.ini. 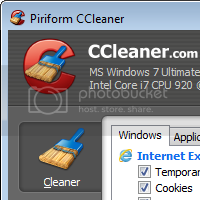 Copy/Cut and paste the file into the directory with ccleaner.exe and/or ccleaner64.exe.